If you're going into Jon Favreau's Chef expecting something new or innovative in the realm of filmmaking or storytelling, then I'm sorry to disappoint you. Chef sticks to the basics, with a plot so predictable that you can guess how it all plays out within ten minutes. There's no reinventing the wheel, just Favreau working with his friends in the service of an age old story about the busy man who needs to slow down and appreciate life, interspersed with lengthy montages set to his favorite music. And that's not a bad thing at all. 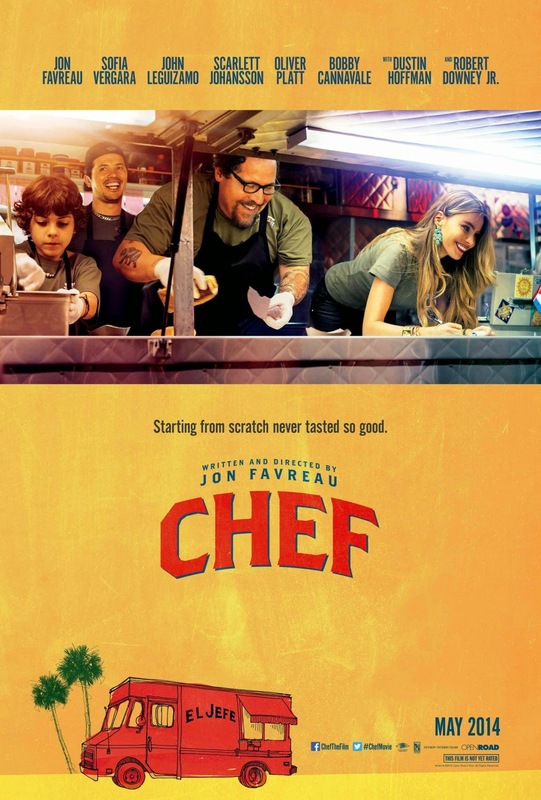 Chef is the cinematic equivalent to comfort food, appropriate considering that's the Raison d'être of titular character Carl Casper (Favreau). He was once known for his adventurous menus, for risk taking, but since he's been the chef for Riva (Dustin Hoffman)'s Los Angeles restaurant, Casper's had to curtail his ambitions. He still likes to change things up, with the support of his sous chef Tony (Bobby Cannavale) and line cook Martin (John Leguizamo), but when influential food critic Ramsey Michel (Oliver Platt) comes in to review the menu, Riva orders him to "stick with the classics." Michel tears the menu apart, and Casper mistakenly takes to social media to air his grievances, and becomes an unwitting viral sensation. With no job and nobody interested in hiring him after a notorious YouTube meltdown, Casper agrees to join his ex-wife, Inez (Sofia Vergara) on a trip to Miami. Carl will keep an eye on his son, Percy (Emjay Anthony), who Casper tries to be a good parent for, but often falls short. While in Miami, Inez suggests that Carl reconsider her food truck idea, and that his Cubanos are better than anything they eat down there. Even if you couldn't see the poster next to this review, I'm almost positive you can figure out exactly where Chef goes from here, and I'll even throw in the fact that once Carl starts up El Jefe, Martin flies in and drives with Casper and Percy back to Los Angeles. I mentioned in my review of Frank that Chef's only real novelty is its mostly accurate portrayal of how social media works, largely through Percy. Carl has no idea how to use Twitter and makes the mistake of using his new account to attack Ramsey Michel publicly. Percy uses Facebook, Twitter, Instagram, and Vine to document their trip across country (notable stops include New Orleans and Austin), as well as to advertise where they'll be next. While I can't say how long Chef will be out there before some of this seems dated, Favreau does use the concept of "viral videos" and the new "social" world we live in a way that doesn't feel contrived. This is mostly speculation on the part of the Cap'n, but it feels like Chef is a "back to basics" for Favreau after Cowboys & Aliens. It's a stripped down, less complicated movie that limits special effects to on-screen indicators of someone tweeting (I can't lie, hearing a "bird" noise after every "message sent" got a little old) and an almost bare bones plot. Again, this is not a bad thing, and if it was the palate cleanser that he needed after the lukewarm reaction to Cowboys & Aliens, then I'm glad that Favreau excels in telling stories we've heard before this well. It's almost surprising how little I minded the fact that I knew exactly where Chef was headed and, beat by beat, it does nothing more than what you'd expect. He makes even the oldest movie clichés feel natural and is amiable enough as the lead that you don't mind he's playing the old favorites. It might also help that Favreau brought along a lot of old friends, even if just for minor roles. I didn't mention that Iron Man and Iron Man 2 alums Scarlett Johansson and Robert Downey Jr. pop up in semi-extended cameos. Johansson plays Molly, the hostess at Riva's restaurant and maybe Carl's girlfriend (this is never really clear, but he definitely takes her home and cooks for her while she's sitting in his bed) who urges him to break out of his routine. Downey Jr. has a one scene cameo as Marvin, Inez's first husband who bankrolls El Jefe and buys the food truck for Carl. He may or may not have hooked up with his ex-wife after Carl split up with her, and he has a penchant for people wearing footies in his office, but Marvin seems like a basically decent guy. It's reasonably clear that Favreau worked with friends as they were available, which explains why Cannavale, Hoffman and Johansson aren't in the last scene when just about everybody else is. There are no real "villains" in Chef - even Oliver Platt has his moment of redemption as Ramsey Michel that leads to an unexpected (from the source, anyway) 11th hour version of a twist. Or as much of one as Chef can have.